Our towns are full of people, and groups that are constantly contributing towards building a better community. Whether it’s through volunteering, donations, guidance, and leadership, these people are the bloodlines of our town. Weed has so many citizens that are continuously building a better future for the area, or providing an outstanding service to the underprivileged, or providing food to those without, building the arts, teaching the Children, showing excellence in accomplishments that have all built Weed into a town that we love to call home. This is why the Weed Chamber of Commerce wants to hear the nominations from the community to congratulate and recognize our citizens and organizations for their involvement with the rest of the community. The Weed Chamber of Commerce is looking for nominations for Citizen of the year, teacher of the year, organization of the year, and meritorious awards. 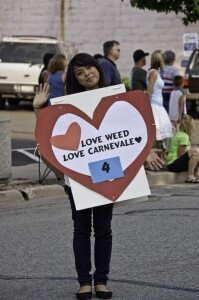 The Chamber will announce the winners after the Weed Carnevale Parade, which begins Wednesday, July 14th at 7pm. The “of the Year” announcements will be held at Centennial plaza by the Weed Mercantile, for a community celebration of only some, of our most outstanding citizens and service groups!! The nomination form is simple to fill out, come on by the Weed Chamber office located at 34 Main St., Right under the Weed Arch in the log cabin. For more info contact the office at 530-938-4624 or email weedchamber@ncen.org and we can forward you the application that way.